During Xenopus oocyte maturation, the amount of a 48 kDa protein detected in the 26S proteasome fraction (p48) decreased markedly during oocyte maturation to the low levels seen in unfertilized eggs. The results indicate that the interaction of at least one protein with the 26S proteasome changes during oocyte maturation and early development. An alteration in proteasome function may be important for the regulation of developmental events, such as the rapid cell cycle, in the early embryo. In this study, we identified p48. p48 was purified by conventional column chromatography. The resulting purified fraction contained two other proteins with molecular masses of 30 (p30) and 37 (p37) kDa. cDNAs encode elongation factor-1γ and δ were obtained by an immuno-screening method using polyclonal antibodies against purified p48 complex, which recognized p48 and p37. N-terminal amino acid sequence analysis of p30 revealed that it was identical to EF-1β. To identify the p48 complex bound to the 26S proteasome as EF-1βγδ, antibodies were raised against the components of purified p48 complex. Recombinant EF-1 β,γ and δ were expressed in Escherichia coli, and an antibody was raised against purified recombinant EF-1γ. Cross-reactivity of the antibodies toward the p48 complex and recombinant proteins showed it to be specific for each component. These results indicate that the p48 complex bound to the 26S proteasome is the EF-1 complex. MPF phosphorylated EF-1γ was shown to bind to the 26S proteasome. When EF-1γ is phosphorylated by MPF, the association is stabilized. p48 bound to the 26S proteasome is identified as the EF-1γ. EF-1 complex is associated with the 26S proteasome in Xenopus oocytes and the interaction is stabilized by MPF-mediated phosphorylation. In vertebrates, fully-grown immature oocytes are arrested in late G2 of meiosis I. Secretion of maturation-inducing hormone (MIH) induces the maturation of oocytes and progression of the cell cycle . The mature oocytes arrest at metaphase of meiosis II. Recent evidence indicates that proteolysis plays an important role in regulation of the meiotic and mitotic cell cycles. Among the various components of the cells proteolytic machinery, the ubiquitin-dependent proteolytic system has attracted a great deal of attention . The 26S proteasome is a protease complex of this system . It has been suggested that proteasomes are involved in the regulation of meiotic cell-cycle progression during oocyte maturation . Inhibitor studies suggest that proteasomes may be involved in the early steps of meiotic maturation in animal oocytes corresponding to the G2-M transition [5, 6]. Other evidence for the involvement of proteasomes in meiotic maturation comes from observations that showed modification of subunits in the 26S proteasome during oocyte maturation in fish and frogs [7–9]. The 26S proteasome was also implicated in regulation of exit from meiotic metaphase [10–13]. Together, these results suggest that proteasomes play a crucial role in the meiotic cell cycle of maturing oocytes. However, proteins that are targeted for proteasome-dependent degradation during oocyte maturation have not been investigated in detail. In a previous study, we examined changes in components of proteasomes during oocyte maturation and early development of Xenopus laevis .Xenopus oocytes are induced to undergo maturation by MIH, which causes G2/M transition. Although no significant changes in the proteins common to 20S and 26S proteasomes were observed during oocyte maturation, the amount of a unique 48 kDa protein detected in the 26S proteasome fraction (p48) decreased markedly during oocyte maturation to the low levels seen in unfertilized eggs. These results indicate that the interaction of at least one protein with the 26S proteasome changes during oocyte maturation and early development. An alteration in proteasome function may be important for the regulation of developmental events, such as the rapid cell cycle, in the early embryo. We demonstrated the interaction between p48 and the 26S proteasome by several criteria. The p48 polypeptide co-purified with protease activity and with components of the 26S proteasome even using a protocol containing a high-salt treatment. 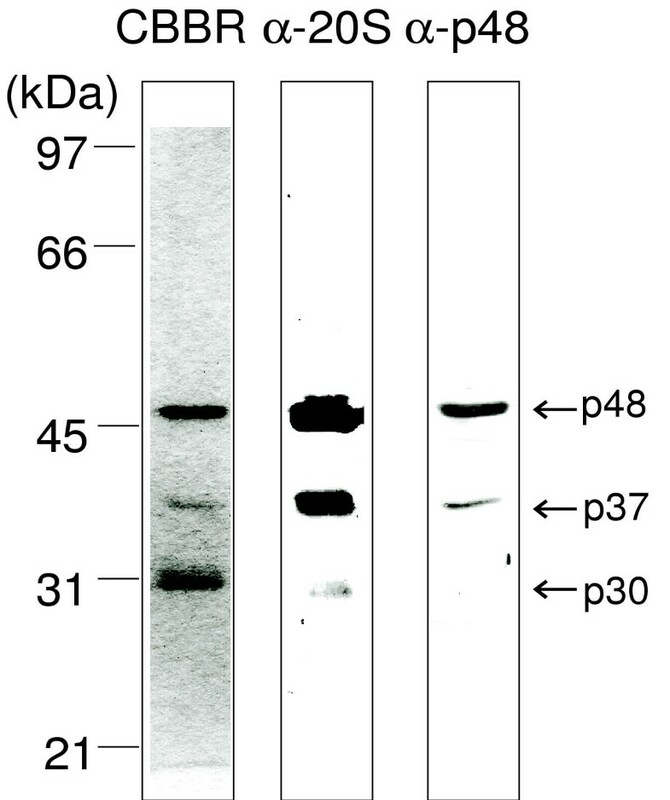 When purified 26S proteasomes were analysed by non-denaturing electrophoresis, p48 was clearly detected in the band corresponding to the 26S proteasome. Furthermore, p48 was immunoprecipitated with the 26S proteasome using a monoclonal antibody raised against the α2 subunit of the 20S proteasome. The results strongly suggested that p48 is associated with the 26S proteasome . In this study, we identify p48 as a component of eukaryotic polypeptide chain elongation factor-1 βγδ (EF-1βγδ complex), EF-1γ, and demonstrate that the EF-1 complex is bound to the 26S proteasome in Xenopus oocytes. EF-1βγδ complex is involved in polypeptide chain elongation via the GDP/GTP exchange activity of EF-1α . Among the components of EF-1βγδ, EF-1γ has been reported to be a major substrate for maturation-promoting factor (MPF) during oocyte maturation in Xenopus laevis [15–17]. EF-1γ is significantly phosphorylated by MPF during the first and second meiotic metaphase, but its physiological role has not been investigated. In this paper we show that phosphorylation of EF-1γ by MPF stabilizes the interaction with the 26S proteasome. The p48 complex, which was not associated with the 26S proteasome, was purified from oocyte extracts by salt-extraction and column chromatography. Fractions were assessed by immunoblotting using anti-20S proteasome polyclonal antibodies. When the 35–80% ammonium sulfate fraction from Xenopus oocyte extracts was applied to a Q-Sepharose column, p48 was separated from proteasomes by linear gradient elution (Fig. 1A). The 26S proteasome is structurally labile and dissociates into subcomplexes during column chromatography, especially on linear gradient elution [18, 19]. Next, a homogeneous fraction was obtained by SP-Sepharose column chromatography (Fig. 1B). The resulting purified fraction contained two other proteins with molecular masses of 30 (p30) and 37 (p37) kDa (Fig. 2). Of these two bands, p37 was cross-reactive with anti-20S proteasome (Fig. 2). Anti-20S proteasome polyclonal antibody cross-reacted with p48 and p37. These results suggested that p48 is part of a complex with p30 and p37. Purification of p48 The p48-containing fraction was purified as described in Materials and Methods. A, Q-Sepharose column chromatography: 35–80 % ammonium sulfate fraction was applied to a Q-Sepharose column (2.6 × 10 cm). Proteins were eluted with a linear gradient of NaCl and the 0.3–0.5 M eluate was collected in 10 ml fractions. B, SP-Sepharose column chromatography: p48-containing fractions from a Q-Sepharose column were pooled and applied to a SP-Sepharose column (1.6 × 10 cm). Proteins were eluted with a linear gradient of NaCl and the 0–0.25 M eluate was collected in 10 ml fractions. Fractions were assessed by immunoblotting using anti-Xenopus 20S proteasome. Protein bands of p48 and subunits of 20S proteasome are indicated by arrows and square brackets, respectively. Proteasome activity of the fractions toward a fluorogenic peptide substrate (Suc-Leu-Leu-Val-Tyr-MCA) was determined in the presence (●) and absence (○) of 0.05% SDS as described (21). Elution profile was monitored by absorbance at 280 nm (—). To investigate this further we prepared polyclonal antibodies against the purified p48 fraction. A polyclonal antibody cross-reactive with p48 and p37 was obtained (Fig. 2). Immunoscreening a cDNA library using the anti-p48 complex identified two groups of cDNA clones encoding elongation factor-1 (EF-1) γ and δ. N-terminal amino acid sequence analysis of p30 revealed the peptide sequence XFGDLKSPAGLKVL, which was identical to that of Xenopus EF-1β. Immunoblotting of purified p48 fraction The purified p48 fraction was analyzed by electrophoresis under denaturing conditions (12.0% gel) and either stained with Coomassie Brilliant Blue (CBBR) or immunostained with antibodies (α-20S: anti-Xenopus 20S proteasome, α-p48: anti-p48 fraction) after electroblotting. Protein bands are indicated by arrows. Molecular masses of standard proteins are indicated on the left. These results suggested that the p48-containing protein complex bound to the 26S proteasome was EF-1βγδ. To confirm this, recombinant EF-1β,γ and δ were expressed in E. coli to examine cross-reactivity with antibodies, and an antibody against purified recombinant EF-1γ was prepared. Reactivity of the antibodies between the p48 complex and the recombinant proteins was examined (Figure 3). As expected, each antibody preparation displayed a specific reaction for a different polypeptide. Anti-p48 complex polyclonal antibodies cross-reacted with p48 and p37 in purified p48 complex and the 26S proteasome. The polyclonal antibody cross-reacted with recombinant EF-1γ and δ. Anti-EF-1γ polyclonal antibodies recognized p48 in p48 complex and the 26S proteasome. The monoclonal antibody against p30 in the p48 complex was cross-reactive with p30 in the 26S proteasome and recombinant EF-1β. Thus, we concluded that p48 complex bound to the 26S proteasome was the EF-1βγδ complex. Identification of p48 complex as an EF-1 complex Purified fractions were separated by electrophoresis under denaturing conditions (12.0% gel) and stained with Coomassie Brilliant Blue (CBBR) or immunostained with antibodies (α-p48: anti-p48 fraction, α-EF-1γ: anti-recombinant EF-1γ, α-p30: anti-p30 monoclonal antibody) after electroblotting. Lanes 1 to 5 were as follows; 1, purified p48 fraction; 2, purified 26S proteasome from immature oocytes; 3, recombinant EF-1β; 4, recombinant EF-1γ; 5, recombinant EF-1δ. Protein bands are indicated by arrows. Molecular masses of standard proteins are indicated on the left. In Xenopus, EF-1γ has been shown to be the major substrate for maturation-promoting factor (MPF) [15–17]. The fluctuation pattern of p48 correlated well with the activation of MPF . We examined how phosphorylation affects immunoreactivity with the antibody. When extracts from mature oocytes were treated with alkaline phosphatase, the p48 band appeared (Fig. 4). A phosphatase inhibitor, sodium vanadate, reduced the effect of alkaline phosphatase and the p48 band remained undetectable. Immunoblotting with anti-EF-1γ confirmed that the disappearance of p48 was not caused by undesirable proteolytic degradation during the reaction. These results suggested that anti-20S proteasome polyclonal antibodies recognize the epitope on EF-1γ affected by phosphorylation with MPF. Alkaline phosphatase treatment of extracts from mature oocytes Extracts from mature oocytes were treated with calf intestinal alkaline phosphatase in the presence and absence of sodium vanadate (10 μM) as described in Methods. Lanes I and M correspond to extracts from immature and mature oocytes. Samples were immunoblotted with anti-proteasome antiserum (α-20S) and a guinea pig polyclonal antibody to recombinant EF-1γ (α-EF-1γ). We analysed whether MPF phosphorylated EF-1γ bound to the 26S proteasome. As shown in Figure 5, the p48 band was phosphorylated by MPF. When the samples were immunoprecipitated by anti-EF-1γ, phosphorylated bands including p48 were obtained in the precipitates. 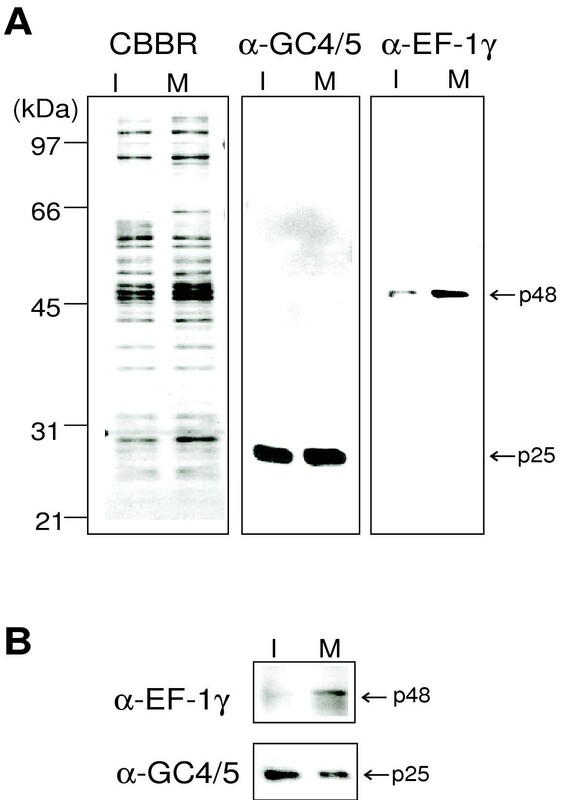 These results confirm that the phosphorylated p48 band was EF-1γ (Fig. 5B). p37 and p30 were auto-phosphorylated in the 26S proteasome fraction. EF-1β and EF-1δ were shown to be phosphorylated by casein kinase II . It has also been reported that casein kinase II co-purified with the 20S proteasome . It seems likely that phosphorylation of p37 and p30 was caused by casein kinase II in the 26S proteasome fraction. According to previous results, EF-1γ in isolated EF-1 complex is phosphorylated by MPF [15–17]. 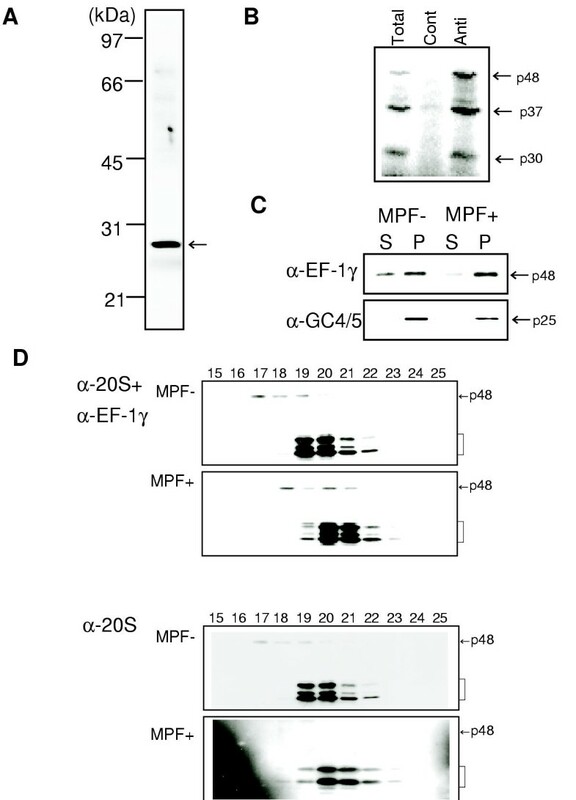 However, as shown in Figure 5, EF-1γ in the isolated EF-1 complex was not phosphorylated, whereas EF-γ bound to the 26S proteasome was a good substrate for MPF under our experimental conditions. Although, it is necessary to clarify the differences between the preparations, it is possible that the EF-1 complex may bind to the 26S proteasome under physiological conditions. Phosphorylation of EF-1γ bound to the 26S proteasome (A) Phosphorylation of p48 complex and the 26S proteasome by MPF. Purified p48 complex and the 26S proteasome from immature oocytes were treated with or without MPF as indicated in the presence of [γ-32P]-ATP. After incubation at 30°C for 1 hour the reaction was stopped by addition of SDS-PAGE sample buffer. 32P-labeled proteins were resolved by SDS-PAGE followed by autoradiography on Imaging plates (Fuji Film). (B) Immunoprecipitation of p48 complex by anti-EF-1 complex. The 26S proteasome fractions were treated with affinity purified anti-EF-1 complex (Anti) or control IgG (Cont) and EF-1 components were immunoprecipitated as described previously . Supernatants (S) and precipitates (P) were resolved by SDS-PAGE followed by autoradiography. Arrows indicate 32P-labeled 48, 37 and 30 kDa protein bands. Image analysis was performed using a Molecular Imager FX (BioRad). We examined the role of phosphorylation by MPF on the interaction between EF-1 complex and the 26S proteasome. The 26S proteasome is structurally labile and dissociates into subcomplexes during incubation and/or column chromatography. Interactions between regulatory proteins and the 26S proteasome are relatively weak; EF-1 complex was dissociated from the 26S proteasome by linear gradient elution on an ion-exchange column (Fig. 1). Dissociation of EF-1 complex from the 26S proteasome also occurred during immunoprecipitation and gel filtration chromatography under high salt conditions (Fig. 6). Anti-goldfish 26S proteasome antibody cross-reacted with the 26.5 kDa subunit of Xenopus proteasome and not with the components of EF-1 complex (Fig. 6A). Phosphorylated EF-1 complex was immunorecipitated by the antibody (Fig.6B). When EF-1 complex was treated with MPF, almost all of the EF-1γ was detected in the immunoprecipitate (Fig. 6C). Under low salt conditions, EF-1 complex was obtained in the fractions corresponding to the 26S proteasome on gel column chromatography as described previously  (Data not shown). Under high salt conditions, the 26S proteasome was dissociated into the 20S proteasome and regulatory complexes, and the 20S proteasome were obtained in the fractions of low molecular mass. When the 26S proteasome was analysed by gel filtration chromatography after incubation in the absence of MPF, EF-1γ was obtained in fractions other than the 20S proteasome fraction. However, a portion of the EF-1γ eluted into the fractions with the 20S proteasome after incubation with MPF (Fig. 6D). It is comfirmed that MPF phosphorylated p48 interacted with the 26S proteasome by immunoblot using anti-20S proteasome polyclonal antibodies. The p48 band was detected in MPF-untreated fractions but not in MPF-treated ones. These results suggest that phosphorylation by MPF is responsible for stabilizing the interaction between EF-1 complex and the 26S proteasome and that EF-1 complex may interact with subunits of the 20S proteasome. Stabilization of association between EF-1 complex and the 26S proteasome by phosphorylation with MPF (A) The 26S proteasome fraction from Xenopus immature oocytes was resolved by electrophoresis under denaturing conditions (12 % gel) and immunostained with anti-goldfish 26S proteasome polyclonal antibody. (B) The 26S proteasome from immature oocytes was treated with MPF for 1 hour at 30°C. Samples were treated with affinity purified anti-goldfish 26S proteasome (Anti) or control IgG (Cont) and the 26S proteasomes were immunoprecipitated. Untreated sample (Total) and precipitates were resolved by SDS-PAGE followed by autoradiography. Arrows indicate 32P-labeled 48, 37 and 30 kDa protein bands. (C) The 26S proteasome from immature oocytes was treated with (MPF+) or without (MPF-) MPF for 1 hour at 30°C. Samples were immunoprecipitated using affinity-purified anti-goldfish 26S proteasome. Supernatants (S) and precipitates (P) were immunoblotted with antibodies (α-EF-1γ; anti-recombinant EF-1γ: α-GC4/5; anti-20S proteasome α2 subunit mouse monoclonal antibody). Protein bands of EF-1γ (p48) and α2 subunit of 20S proteasome (p25) are indicated by arrows. (D) Samples were analyzed by chromatography on a G4000SWXL column equilibrated with 50 mM Tris-HCl buffer, pH 7.5, containing 20% glycerol, 10 mM 2-mercaptoethanol and 0.1 mM ATP as described previously  in the presence of 0.5 M NaCl. Fractions were assessed by immunoblotting using a mixture of anti-Xenopus 20S proteasome and anti-EF-1γ polyclonal antibodies (α-20S+α-EF-1γ) or anti-Xenopus 20S proteasome (α-20S). Protein bands of EF-1γ (p48) and subunits of 20S proteasome are indicated by the arrow and square brackets, respectively. 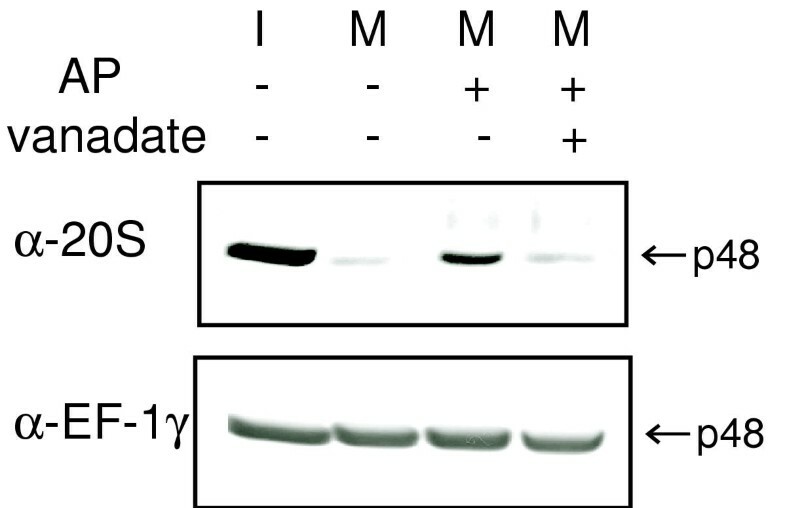 The subunit patterns of 26S proteasomes purified from immature and mature oocytes were compared by immunoblotting using the antibody preparations (Fig. 7A). A 25 kDa band (p25) of the α2 subunit of the 20S proteasome, which cross-reacted with anti-GC4/5, displayed no detectable difference. The α2 subunit of 20S proteasome is ubiquitous during oocyte maturation and showed no significant changes in Xenopus  and goldfish . However, the p48 band was predominantly detected in the 26S proteasome purified from mature oocytes. The amount of p48 was also different between the immunoprecipitates from the extracts of immature and mature oocytes (Figure 7B). These results are consistent with our findings of in vitro phosphorylation by MPF (Figure 6) and suggest that phosphorylation by MPF is responsible for stabilizing the interaction between EF-1 complex and the 26S proteasome in vivo. Changes in association between EF-1 complex and the 26S proteasome during oocyte maturation (A) Immunoblotting of the purified 26S proteasomes. 26S proteasomes were analyzed by electrophoresis under denaturing conditions (12.0% gel) and either stained with Coomassie Brilliant Blue (CBBR) or immunostained with antibodies (α-GC4/5; anti-20S proteasome α2 subunit mouse monoclonal antibody, α-EF-1γ: anti-recombinant EF-1γ) after electroblotting. Lanes I and M indicate 26S proteasomes from immature and mature oocytes, respectively. (B) Oocyte extracts from Xenopus immature and mature oocytes were immunoprecipitated using affinity-purified anti-goldfish 26S proteasome. Precipitates were immunoblotted with antibodies. Lanes I and M indicate extract from immature and mature oocytes, respectively. Protein bands of EF-1γ (p48) and α2 subunit of 20S proteasome (p25) are indicated by arrows. Molecular masses of standard proteins are indicated at the left. Recently, interactions between the 26S proteasome and other factors have been widely investigated . Subunit 4 (S4) ATPase of the 26S proteasome was identified as a novel E7-binding protein . E7, the human papilloma virus oncoprotein, binds to S4 through the carboxy-terminal zinc-binding motif. The XPB subunit of repair TFIIH is also known to directly interact with SUG1, the 45 kDa subunit of the 26S proteasome . HEC, a protein highly expressed in cancer cells, binds to the 26S proteasome in a cell-cycle dependent manner . The reversible interaction between CCTε and the 26S proteasome has been investigated . A protein kinase, SnRK, has been shown to interact with α4 subunit of the 26S proteasome . Furthermore, various proteasome-interacting proteins were identified by mass spectrometric analysis . These results suggested that particular functions of the 26S proteasome are regulated by specific interactions between factors other than subunits of the 26S proteasome. Likewise, the interaction between EF-1 complex and the 26S proteasome investigated in this study is noteworthy. Several model structures of EF-1 complex have been put forward [20, 28]. In Xenopus, Minella et al. suggested the model of a protein complex comprised of EF-1β,γ,δ and transfer RNA synthetase . However, they also demonstrated that EF-1 complex was obtained in the high molecular weight fraction (more than 750 kDa) when the cytosolic fraction was directly separated by gel filtration chromatography . Their results suggested that EF-1 complex in Xenopus oocyte is part of the high molecular weight complex. The results of the present study show that EF-1 complex is bound to the 26S proteasome in Xenopus oocytes. This is supported by the fact that isolated EF-1 complex displays some abnormal characteristics. Firstly, EF-1 complex in oocyte extract or in the 26S proteasome fraction can be separated by gel filtration chromatography, but isolated EF-1 complex could not, even using high salt conditions (0.5 M NaCl). This result may be caused by undesirable interaction between the isolated EF-1 complex and the resin (data not shown). Secondly, the isolated EF-1 complex was not a good substrate for MPF, whereas that bound to the 26S proteasome was readily phosphorylated (Fig. 5). These results suggest that EF-1 complex is bound to the 26S proteasome under physiological conditions. In this study, we demonstrate that EF-1 complex is bound to the 26S proteasome in Xenopus oocytes. Furthermore, we show that phosphorylation by MPF stabilizes the association. Although, the physiological role of the interaction remains to be determined, we favor the notion that the 26S proteasome acts as a positive regulator of the EF-1 complex based on the phosphorylation state of EF-1γ after fertilization. As we showed in a previous study, the intensity of the p48 band remains low until midblastula transition (MBT) . Phosphatase treatment indicates that EF-1γ is highly phosphorylated until MBT. A portion of EF-1 complex may be involved in the synthesis of proteins concerned with rapid cell division. To realize the rapid cell cycle, the EF-1βγδ should be in a complex with the 26S proteasome. Indeed, physiological interactions between proteasomes and ribosomes or ribosome-associated proteins suggest that proteasomes are involved in the regulation of translational processes [27, 30, 31]. Another possibility is that the EF-1 complex may act as a positive regulator of the ubiquitin-dependent proteolytic pathway. 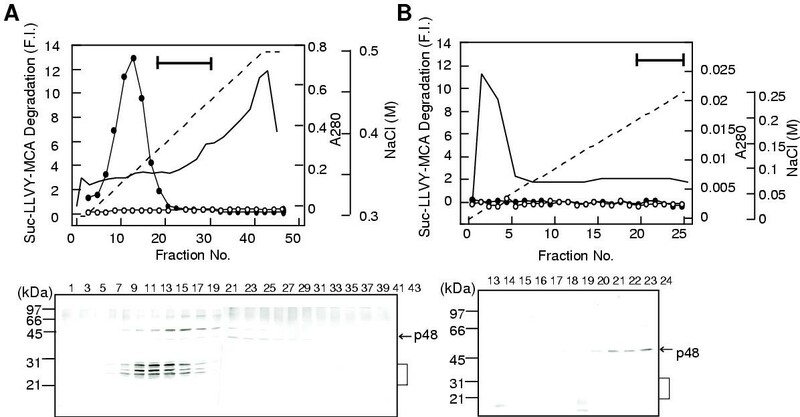 EF-1α has been reported to be a positive regulator in the degradation of N-acetylated proteins by the ubiquitin-dependent proteolytic pathway [32, 33]. Recently, the interaction between the 26S proteasome and EF-1α was demonstrated by mass spectrometry analysis of affinity-purified proteasomes . EF-1 complex may stimulate the function of EF-1α. Studies into the physiological roles of the association between the 26S proteasome and EF-1 complex may assist in helping to understand the regulation of protein synthesis and breakdown. In this study, we demonstrated that EF-1 complex is bound to the 26S proteasome in Xenopus oocytes. Furthermore, we showed that phosphorylation by MPF stabilizes the association. Our results raise the possibility that the 26S proteasome may contribute to the regulation of protein synthesis and breakdown through an interaction with the EF-1 complex. The p48 fraction was purified from Xenopus laevis oocyte cytosol prepared from immature oocytes as described below. The 35–80 % ammonium sulfate fractions were prepared from the cytosol. The ion concentration in the dialyzed fraction was adjusted with NaCl equilibrated to 0.3 M NaCl in electric conductivity. The fraction was applied to a Q-Sepharose column (2.6x10 cm) equilibrated with 20 mM Tris-HCl, pH 8.0 (TN buffer) containing 0.3 M NaCl. The column was washed with the same buffer, and proteins were eluted with a linear gradient of NaCl from 0.3 to 0.5 M at a flow rate of 90 ml/hr. Fractions of 10 ml were collected and the amount of p48 was assessed by immunoblotting using anti-20S proteasome polyclonal antibodies. The fractions with the p48 band were pooled and diluted ten fold with TN buffer. Then, the fraction was applied to an SP-Sepharose column (1.6 × 10.0 cm) equilibrated with TN buffer. Adsorbed materials were eluted with a linear gradient of NaCl from 0 to 0.25 M and fractions of 10 ml were collected at a flow rate of 90 ml/hr. Fractions with the p48 band were pooled and concentrated by loading onto a Q-Sepharose column (1.0 × 4.1 cm). The concentrated fractions were pooled as the final purified preparation, frozen in small aliquots and stored at -80°C. All purification procedures were performed at 4°C. Proteins were separated by polyacrylamide gel electrophoresis under denaturing conditions (SDS-PAGE with 12% gel) by the method of Laemmli , and transferred onto Immobilon membranes (Millipore) using a standard protocol. Membranes were blocked in 5% non-fat powdered milk, and incubated with primary antibodies for 1 hr at room temperature. Immunocomplexes were visualized using an ECL detection kit (Amersham Pharmacia Biotech), as described previously . Xenopus ovary cDNA library was constructed in the Uni-ZAP XR vector (Stratagene). Using polyclonal antibodies against the purified p48 fraction prepared in this study, immunoscreening was carried out as described previously . From the isolated plaques, plasmid DNA was prepared by the in vivo excision protocol using the ExAssist/SOLR system (Stratagene). DNA sequencing was performed using a 377A DNA sequencer (Perkin Elmer ABI) with a Dye Terminator Cycle Sequencing Kit (Perkin Elmer ABI). The full-length ORFs of Xenopus EF-1β,γ and δ were cloned into the pET21b expression vector (Novagen) at the Nde I and Xho I sites. These were constructed from each cDNA by the PCR method. The recombinant proteins were produced in E. coli BL21(DE3)pLysE and purified by affinity chromatography on Ni-NTA Agarose (Qiagen) column according to the manufacturer's instructions . The 26S proteasome was purified from immature Xenopus oocytes as described . Peptidase activity with or without 0.05% SDS was assessed using the fluorogenic peptide substrate, Suc-LLVY-MCA, as described previously . Antibodies against purified p48 complex were prepared as described previously . Polyclonal antiserum cross-reactive with p48 and p37 and a monoclonal antibody cross-reactive with p30 (EF-1β) were obtained. A polyclonal antibody against recombinant EF-1γ was prepared as follows. Affinity-purified recombinant EF-1γ (20 μg of protein) in complete Freund's adjuvant was injected into guinea pigs at ten-day intervals until sufficient titer was obtained. The antiserum to Xenopus 20S proteasome and a monoclonal antibody to goldfish 20S proteasome α2 subunit were prepared and used as previously described [7, 38]. Immunoprecipitation was performed with IgG fractions that had been purified from serum on a protein A-Sepharose CL-4B column (Ammersham Pharmacia) as described previously . Extracts from Stage VI oocytes (immature oocytes) and ovulated eggs (mature oocytes) were prepared as described previously . Stage VI oocytes were manually isolated from Xenopus ovarian fragments. Ovulated eggs were dejellied with 2% cysteine solution. Groups of twenty oocytes or eggs were washed in MPF extraction buffer (80 mM β-glycerophosphate, 50 mM NaF, 20 mM EGTA, 15 mM MgCl2, 20 mM HEPES, pH 7.5) and transferred to 1.5 ml Eppendorf microcentrifuge tubes. The excess buffer was removed, and 100 μl of fresh buffer was added. The samples were crushed with 5 strokes of a plastic pestle and centrifuged for 10 min at 13,500 rpm at 4°C in a fixed angle rotor (TOMY Model MX-160 microcentrifuge). The clear supernatant (100 μl) was collected for electrophoresis and immunoblotting. Egg extracts were treated with calf intestine alkaline phosphatase (Boehringer Mannheim, 60 U) for 60 min at 30°C in the presence of protease inhibitors (chymostatin, leupeptin and pepstatin, 500 μg/ml each). Phosphatase-treated egg extracts were assessed by immunoblotting using anti-20S proteasome polyclonal antibodies. Aliquots (4 μl) of purified p48 complex or the 26S proteasome were incubated in a total volume of 20 μl. The reaction mixture contained 10 mM Tris-HCl, pH 7.5, 1 mM MgCl2, 4 mM 2-mercaptoethanol, 40 μM ATP and 10 μM [γ-32P]-ATP (0.37 Tbq/mmol) with or without 2 units of recombinant human MPF (BIOMOL). Reactions were performed at 30°C for 1 hour and terminated with SDS-PAGE sample buffer. 32P-labeled proteins were resolved by SDS-PAGE and visualized by autoradiography on Imaging plates (Fuji Film). We are grateful to the staff of the Radiochemistry Research Laboratory and Institute for Genetic Research and Biotechnology of Shizuoka University for the use of equipment. We also thank Y. Makino of the Center for Analytical Instruments of the National Institute for Basic Biology for providing technical assistance in amino acid sequence analysis. This work was supported by Grants-in-Aid for Scientific Research on Priority Areas from the Ministry of Education, Culture, Sports, Science and Technology of Japan and the CREST Research Project of the Japan Science and Technology Corporation to YN. Part of this study was performed as the National Institute for Basic Biology Cooperative Research Program (00-121 to TT). TT carried out the immunoassays, phosphorylation analysis and also participated in the design of the study and drafted the manuscript. AK, JM, RH and NO participated for protein purification and antibody production. MT participated in cDNA cloning. YN and KI participated in coordination in the design of the study.